The US is topping the list of 'rogue states' who have refused to pay the congestion charge over the past six months. London is apparently behind the fact that house prices just rose by 0.6 per cent, the highest monthly increase since May 2004. Summer drought update: although chances of rota cuts in water or tankers in the streets are 'remote', the chances of rationing in London are growing especially (surprise surprise) if this summer turns out to be 'hot and dry'. Marks & Spencers in Edgware Road is no longer just Marks & Spencers. Now it's 'Your M&S'. The man dressed as a knight and dragging a dragon behind him has finished the marathon, eight days and thirteen minutes after he started. He's the same bloke who wore the diving suit last year. For his next trick he will drive a Mini with flat tyres from Land's End to John O' Groats. 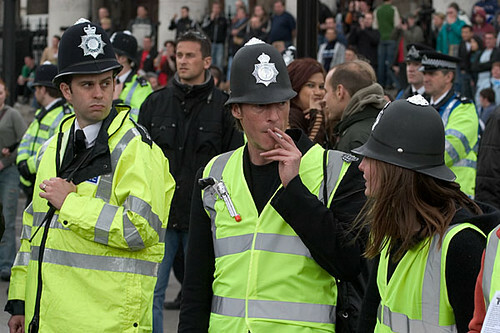 Image of protestors from the May Day demonstration in Trafalgar Square courtesy of Paul Carstairs via the Londonist Flickr group.